There are various was to use debt to help you prepare for a financial crisis and the possibility of civil unrest and complete havoc. Jason Hartman recommends taking advantage of long-term, fixed-rate loans to purchase commodities that will be in high demand, such as real estate. But beyond the obvious choice of purchasing land, there are other simple items that you can stockpile which offer multiple uses. Our last post listed name-brand products that can be used in ways other than their intended use. Now we will explain some everyday items that have extraordinary uses. 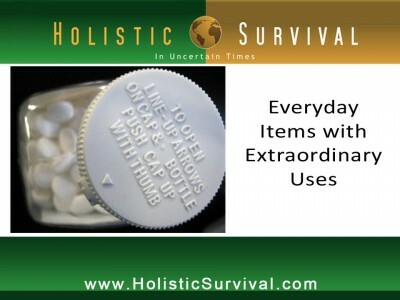 Keeping such items on hand will enable you to make the most of survival following economic collapse. Vinegar: Vinegar has many uses beyond its obvious cooking applications. It can also be used to speed the healing of bruises and reduce the appearance of skin discoloration. Simply soak a cloth or cotton ball in vinegar and apply to the bruised area for at least an hour. If you have a sore throat, drink ¼ cup vinegar mixed with ¼ cup honey. Vinegar and honey will kill the bacteria causing the infection. Honey has antimicrobial properties to soothe your throat and calm your cough. Not to mention, it’ll improve the taste. Honey: Speaking of honey, it has multiple uses as well. In addition to helping with sore throats and coughs, it is a sleep aid, improves digestion, and can help fight disease. When applied to wounds, it will keep the cut free of debris and help prevent infection. It has also been known to treat athlete’s foot, arthritis, and yeast infections. Egg shells: Egg shells have an amazing number of uses. The most helpful one is the egg membrane’s healing qualities. Peel the membrane from inside the shell and apply it to small cuts or scratch. Let the membrane dry and wear it like a bandage. The nutrients in the egg will promote healing and prevent scarring. In addition, egg membranes can be used to clear skin of blackhead pimples, by drawing out the dirt. It also works to draw out splinters. Aspirin: Of course aspirin can help relieve minor aches and pains, but it does have other uses. Teenagers would be happy to know that a crushed aspirin mixed with water makes a paste that can reduce pimples quickly. Simply cover the pimple and rinse after a few minutes. But even more helpful is the aspirin’s ability recharge a car battery. Drop two tablets into the battery, where its acetylsalicylic acid will work with the sulfuric acid in the battery so that you can start the vehicle – but it’ll only start one time so keep that in mind! (Top image: Flickr | atul666).